The cat’s out of the bag… but if you don’t know what that big blue cylinder is that people are lying on in the gym or how on earth to use it, then this is the guide for you! Foam rollers come in many different sizes, colours, and textures, and in this blog we explore all things foam! A foam roller is a cylindrical massage tool made out of - you guessed it - foam! 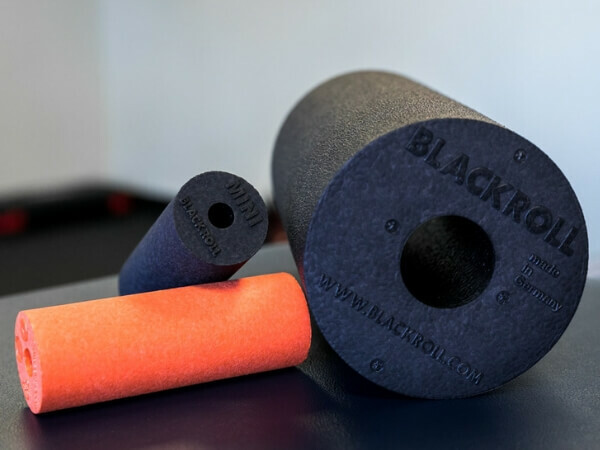 There are many brands that make foam rollers these days, some like BlackRoll who make super high density (really hard) rollers, and some like you’ll find in your gym are lower density, softer, more manageable rollers. They can be used to apply pressure and movement to tight or sore muscles, to release, relax and massage them. 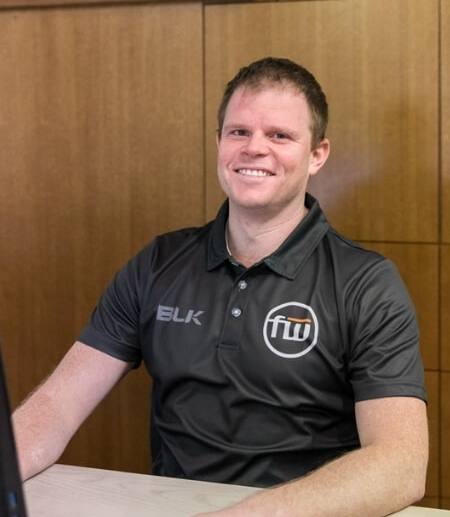 They’re a terrific recovery tool that a lot of professional athletes use in between their physical treatments to stay on top of tension. Which foam roller is right for me? Should you get the black one? Well, it’s totally up to how you respond to each one. Some people might like the super hard roller as they feel it is the only thing that gives them relief from their aches and pains, others might find it too much pressure. It’s best to try out different kinds and see which one you like the best. At Fieldwork we have a pretty big range to choose from and you’re always welcome to use the space in the gym to try these out! Just ask our friendly front of house team next time you’re in the clinic if you would like to test them out! The standard blue rollers are great for beginners. The pressure is manageable, they’re not intimidating, and they’re simple to use. The BlackRoll Mini is a great tool that easily fits into a bag or your suitcase and works really well on hands, feet, forearms, lats, and some smaller muscles or surface areas. It can be used for larger muscles as well! 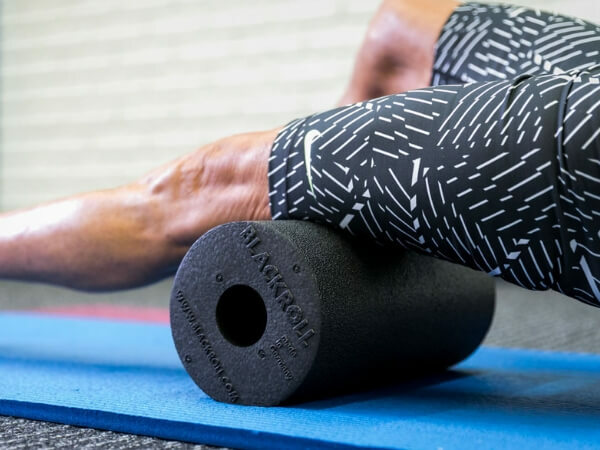 The BlackRoll is fantastic for those who are more experienced with the pressure of a foam roller. It is also perfect for people who have high loads of endurance sports as they may find it works well on their constantly fatigued muscles. Rumble rollers are great for those of you who really need to get into those knots and tight spots! Ok, so now you know what a foam roller is, but how can you use it? They’re really versatile so they can be used in different ways depending if you’re using them to warm up, if you’re using them to release some tension post-workout or if you’re in a DOMS or post-DOMS phase (DOMS stands for delayed onset muscle soreness). Using a foam roller for warm ups will involve lots of broad back and forth rolling, whereas rolling out tension will involve a more targeted approach. So let’s look at these two styles of rolling on our quads. Quads in my context as a cyclist are a very important muscle to be used, as most cyclists are quad dominant with more and more pros paying less attention to glute activation, and accepting that their quads are a major driving force. You can rotate your body to either side, targeting the outside of your quads. This one can be super painful though, so be careful that you don’t apply an intolerable amount of pressure! Now you’re good to ride, squat, run, or whatever you need to do with those warm and loosened up quads! You can spend as much or as little time on this as you feel is necessary, but remember for a warm up you don’t want to roll your muscles into jelly that won’t work when you need them to! So it’s the day after leg day and you know that you need to release your quads after they helped you hit a new PB. The setup is going to be very similar, but you’re going to want to have a more targeted approach to your rolling technique. You may find the middle of your quad excruciatingly painful, so stick to the upper and lower third of the quad to begin with. Again, you can spend as much or as little time doing this as you feel is necessary, and if you’re in full recovery mode, it can help to spend a little more time on release. You can apply these concepts to most of the muscles in your body by lying on the foam roller, finding a sore spot, and then moving the muscle under the pressure of the foam roller. Now that’s a wrap on a beginners guide to using a foam roller! Don’t forget to keep an eye out for them when you’re in the clinic next! And don’t hesitate to give them a try if you’re interested. Whats your favourite area to foam roll? I would love to hear your thoughts!